Boracay Island in the Philippines reminded me of Thailand fifteen years ago. Except for the famous White Beach – that was a little too much like Hat Rin on a full moon. White Beach is worth a visit, but when traveling to Boracay with kids, I recommend staying elsewhere. 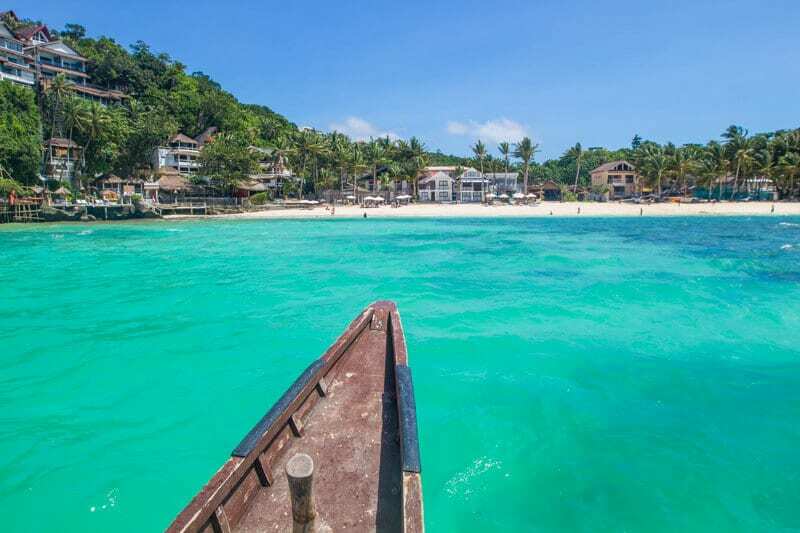 It definitely made our list of things to do in Boracay but I find the other beaches on Boracay Island are just as good, if not better. 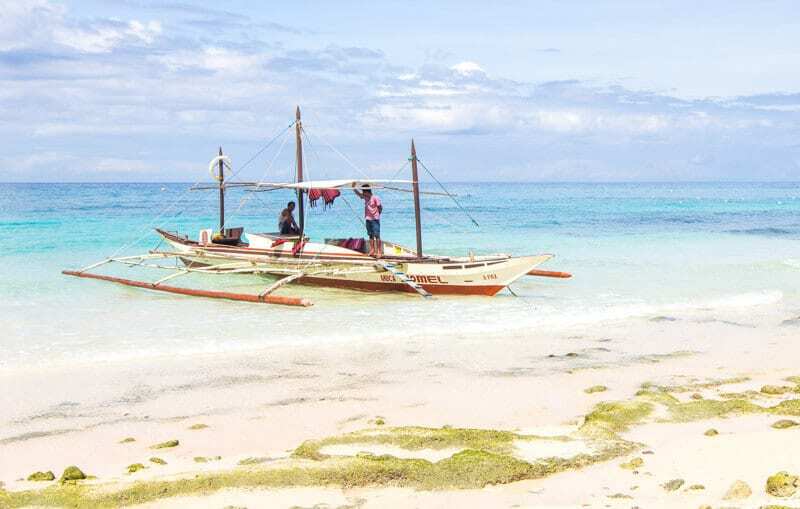 Our family holiday to Boracay was short – only four days – but we loved this island in the Philippines. 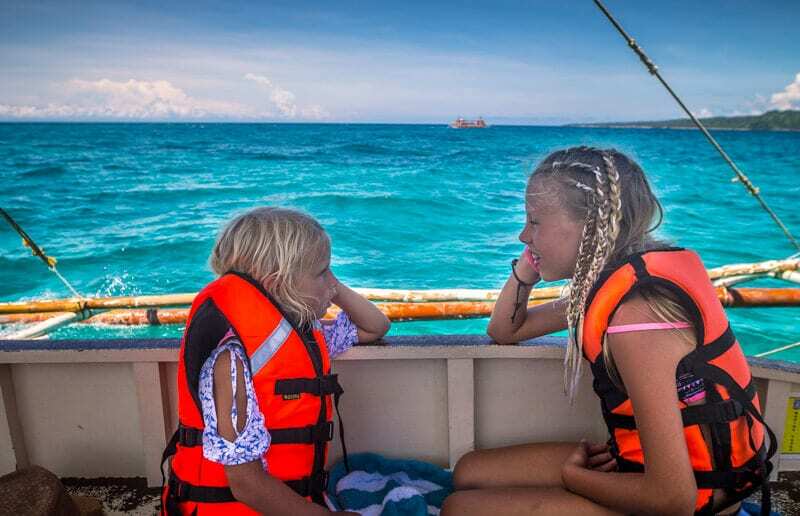 We were sad to leave, the girls especially, and are determined to return to explore Boracay, and the Philippines, in greater depth. If someone were to ask for my recommendations for a great Asian family holiday, I’d recommend Boracay over the more popular Phuket or Bali. 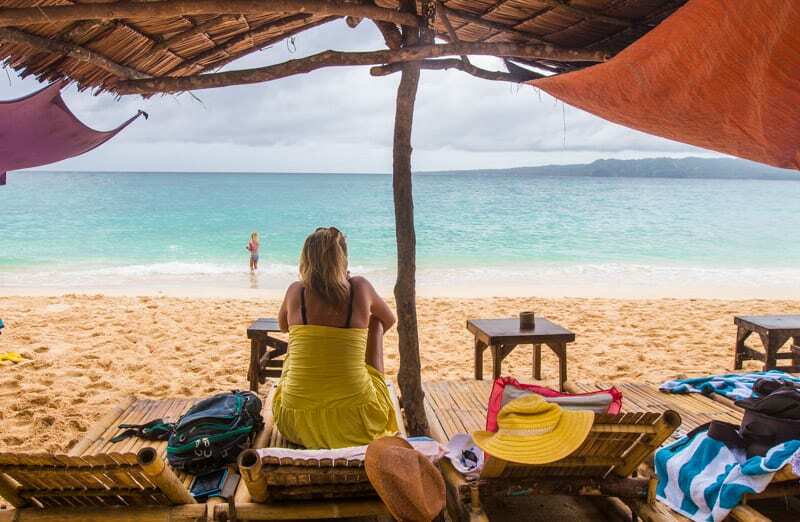 I don’t think the food in the Philippines is as good as Thailand, but the people are just as friendly, the lifestyle super chilled, the beaches some of the best in the world, it’s relatively cheap, and there are plenty of things to do in Boracay with kids. a relaxing island getaway. 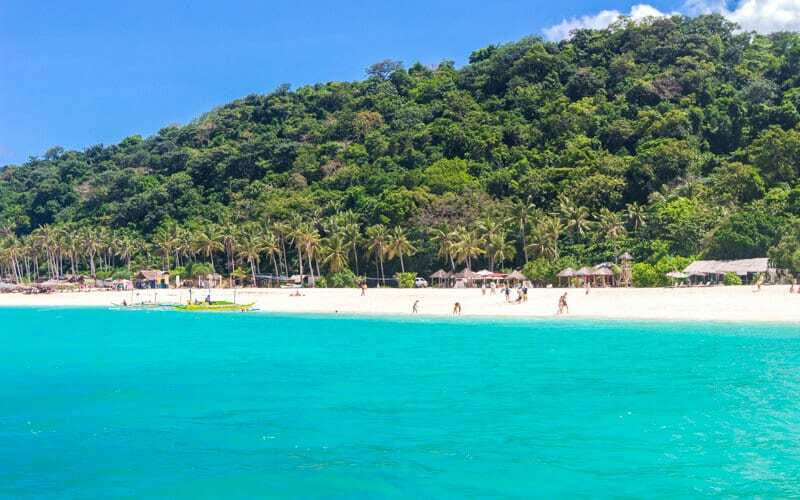 Boracay is a relaxing island getaway. We visited in partnership with GoLocal, a portable wifi rental service that provides travelers with all day data for all their mobile devices throughout their stay for as little as $1.67 per day. I’ll share more about it below, but the service is perfect for families wanting to connect more than one device at a very low price in the Philippines. 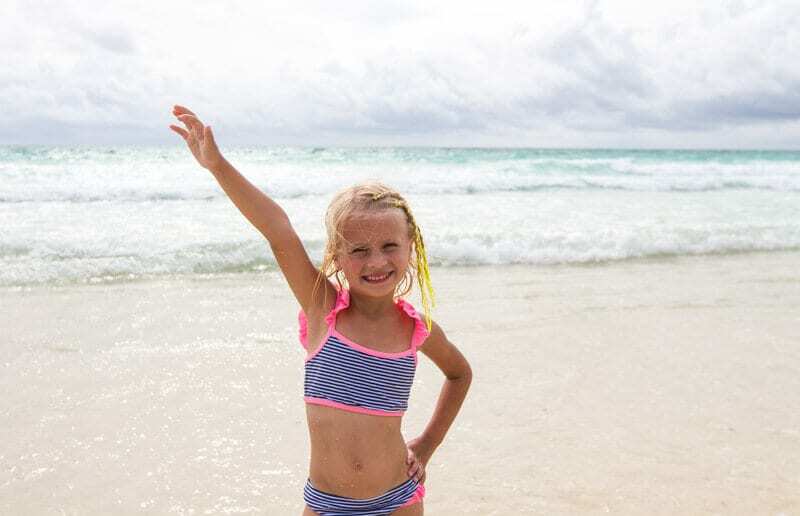 Here are some of the best things to do in Boracay Island with kids that we experienced on our short visit. Punta Bunga Bach has pristine powdery white sand and turquoise waters and no crowds. 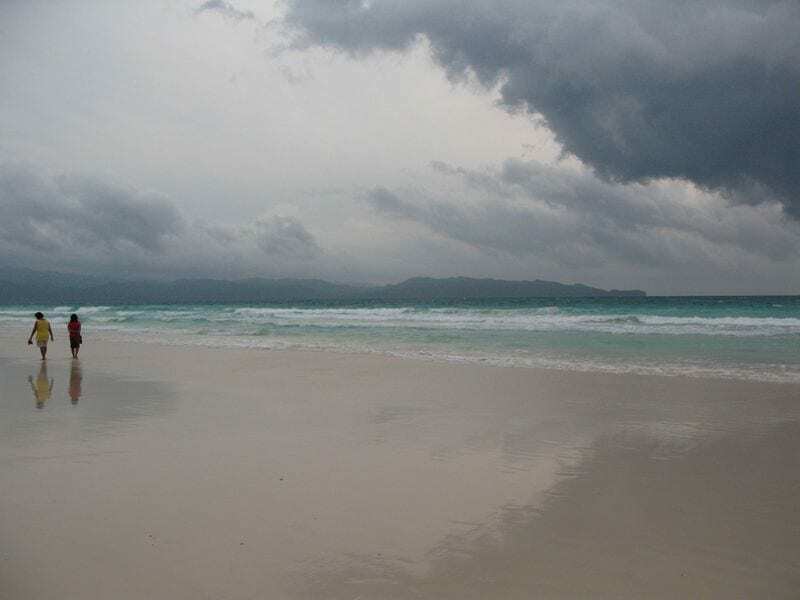 It was our pick of Boracay Beaches and one of the most beautiful beaches I’ve seen in the world. Punta Bunga is a private beach for guests of Movenpick Resort and Shangri-La. I’m not sure if you can get access otherwise, but it’s worth a try because it is one of the best things to do in Boracay. 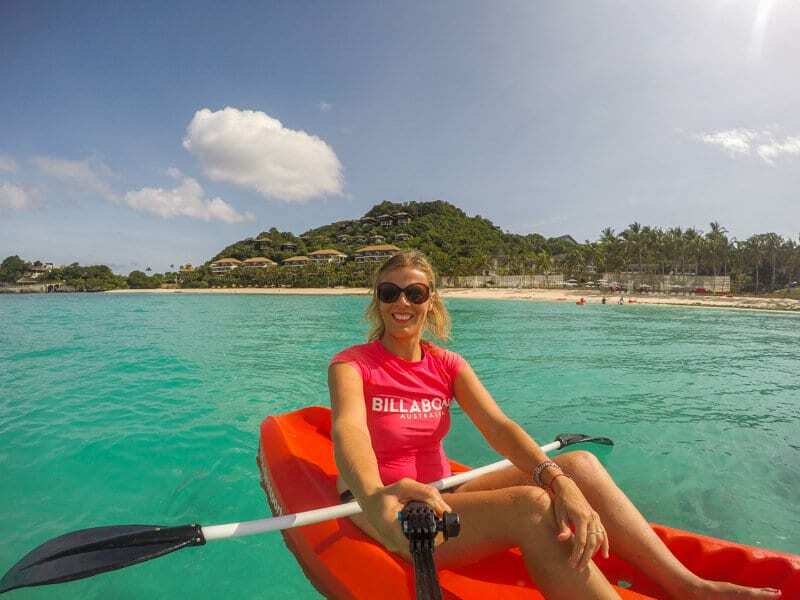 We had a spectacular morning kayaking and stand up paddling in the water. We loved Puka Beach on Boracay Island. The sand may not be white, but it’s a golden color I like just as much. Puka Beach is much quieter than White Beach and reminded me of the Thai beaches like Railey’s Bay back in 1999. We got caught in a torrential rain storm (the tail end of the typhoon), but it soon passed and added to the fun and moody drama. You can hire a beach chair and umbrella – payment by way of overpriced shakes and food. They line the beach so go for a walk first to find one that suits your vibe. It’s worth doing if you intend on hanging around for the day. I’d buy your one drink to reserve your seat and eat at the restaurant at the entrance to Puka Beach. It’s about a third of the price to what they charge for food from the chair rental shacks. Beer is way cheaper than fruit shakes, so why not make that your one drink? Our chair rental shack came with free tubes, which Kalyra spent ages floating out on the water on her own. Savannah wasn’t brave enough to do it, but she loved playing in the waves with Kalyra. The rest of the time she hung with me on the chairs and had her photo taken by passing Filipinos who adored her blonde hair, blue-eyed look. While Kalyra was floating, Craig and I had a cheap foot massage and watched the local boys on their skim boards riding the waves. You can rent them also. I was pretty impressed with the aerial maneuvers they were performing. On our last day in Boracay, the sun shone brightly, and Boracay glimmered. 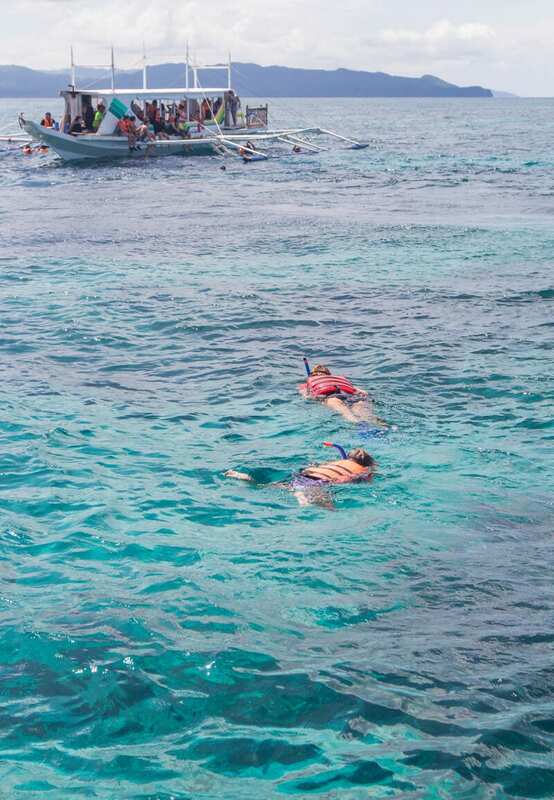 We joined a snorkeling and Boracay Island hopping tour on a banca boat organized by Movenpick Resort. 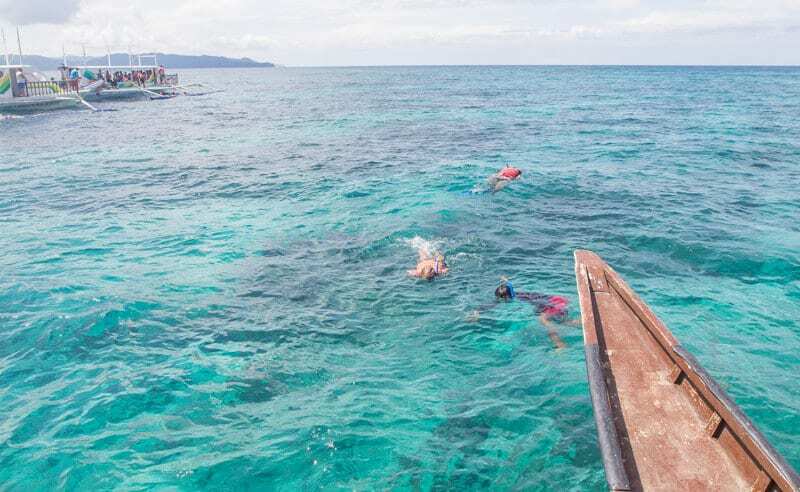 You can join these snorkeling tours anywhere in Boracay and is one of the best things to do in Boracay. It was a fantastic way to spend the day. 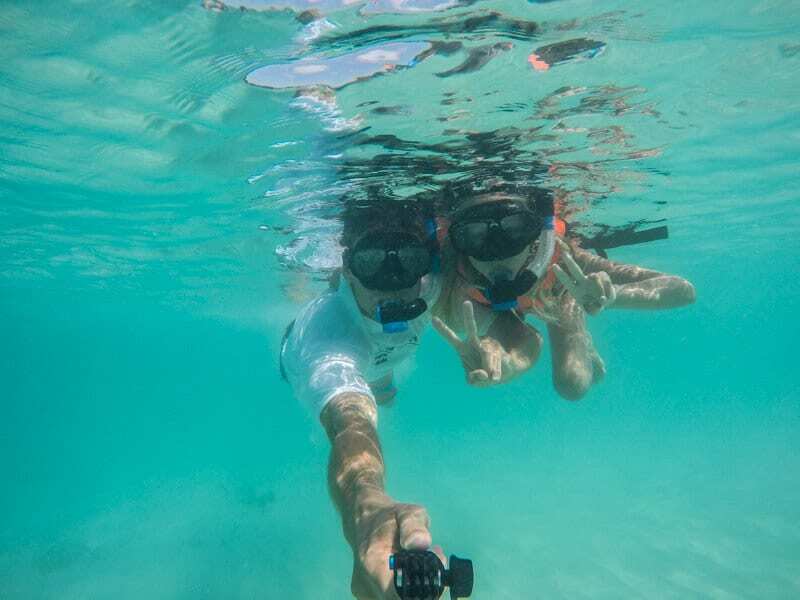 We loved visiting some of the other beaches and enjoying pretty decent snorkeling. I say pretty decently because after you’ve snorkelled the Great Barrier Reef most places from now on will be pretty decent! 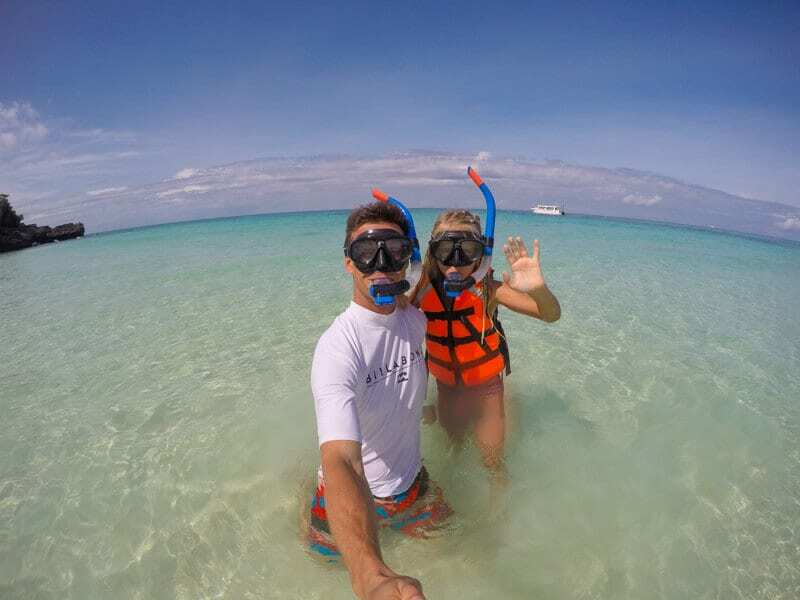 We jumped off the boat for some snorkelling in the waters just offshore from Balinghai Beach. Balinghai is a private beach that looks like it belongs in the Greek Islands. It would be worth a visit if you can get there. Balinghai Beach covers over at high tide, and you do have to pay a fee to enter the beach. Savannah had a brilliant time snorkelling and couldn’t wait to jump back in the boat with the sea animal chart to point out to me what she saw. Our guide told us that close by to this snorkeling spot in the deeper waters; he has seen whale sharks before when scuba diving. Diniwid is a quiet and pretty beach. You can walk here from Station One or catch a trike. Or, like us, visit on your Boracay Island hopping boat tour. Diniwid Beach looks very family friendly. 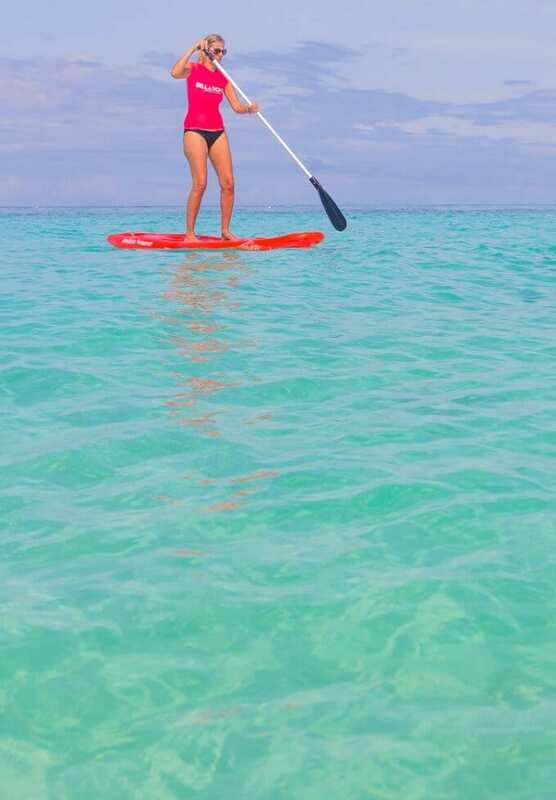 It’s noted everywhere as one of the best things to do in Boracay. This gorgeous little beach on the north east of the island is secluded, but accessible by road via motorbike, bicycle or hiking. I loved our journey to Ilig Iligan past Puka Beach and the bats hanging upside down in the trees on the jungled and rugged coastline on our boat tour. The sand is white (although not as powdery as White Beach), the water is clear and turquoise, and the beach quiet. It’s a good spot for a seafood lunch and snorkeling a little further out from shore. I found the snorkeling at Ilig Iligan Beach better than Balinghai Beach. I don’t think it matters when you visit, the Spider House will exhale a few wows out of your system. Built on the edge of the cliff on the north side of Diniwid Beach, and accessed via a small tunneled cave, its bamboo decks hang out over the water and offer stunning views back towards Diniwid Beach. We arrived by boat on our island tour for a quick snack stop. We picked up calamansi juice and enjoyed the views out over the ocean. You can walk down the stairs from your cliff top position straight into the water and on the reef for a snorkel. Apparently, sunsets on Boracay from the Spider House are spectacular as the sun appears as a giant orb in the sky. 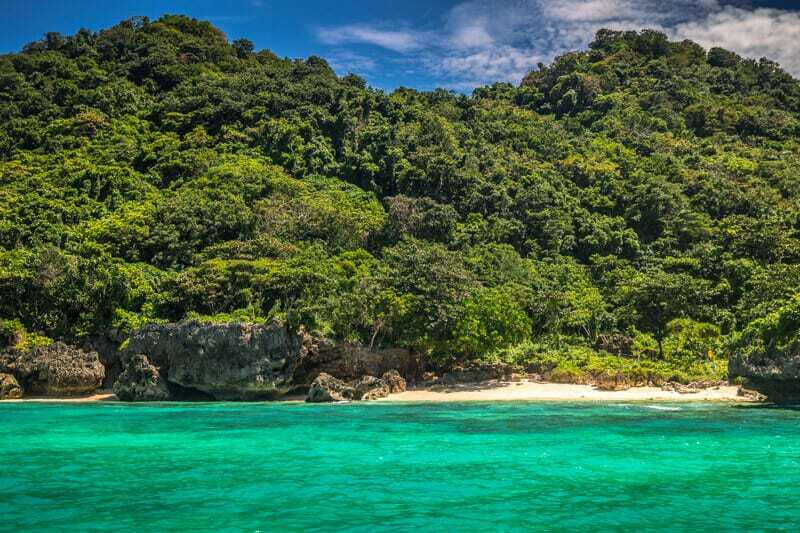 We missed this amazing thing to do in Boracay – don’t you make the same mistake. Post a photo on our Facebook wall if you manage to see it. Hopefully, you’ll get lucky and jag this spot for your sunset cocktail. White Beach is consistently known as one of the best beaches in Asia for its stunning white sand and turquoise water. 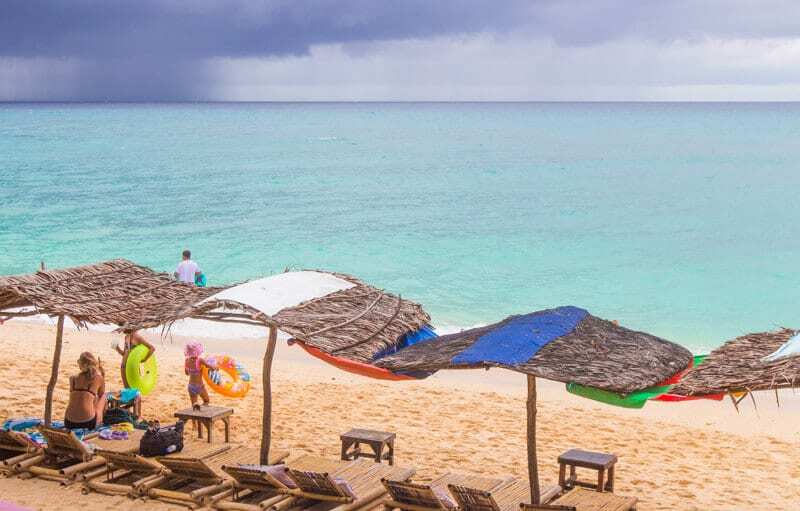 We didn’t get to see White Beach in its full glory as it was overcast – it still looked pretty gorgeous in the grey light. The locals call it Long Beach, as you can also guess, it’s quite long. It’s broken up into three sections called Stations. Station Two is by far the busiest area; Station One is at the northern end, and a little quieter with some excellent views overlooking a small island just off the beach, and Station Three is further south near the jetty port. 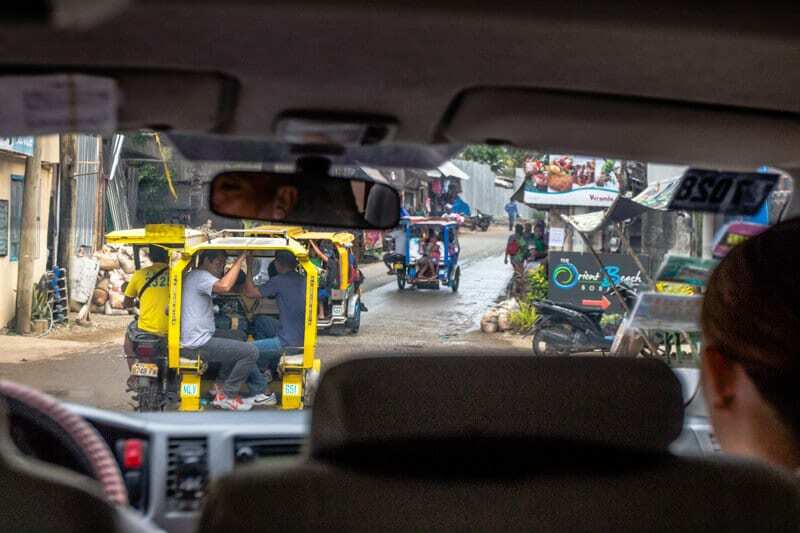 We didn’t visit Station Three, but Andrew had some good tips about it in this post he wrote for us on traveling to the Philippines with a tween. 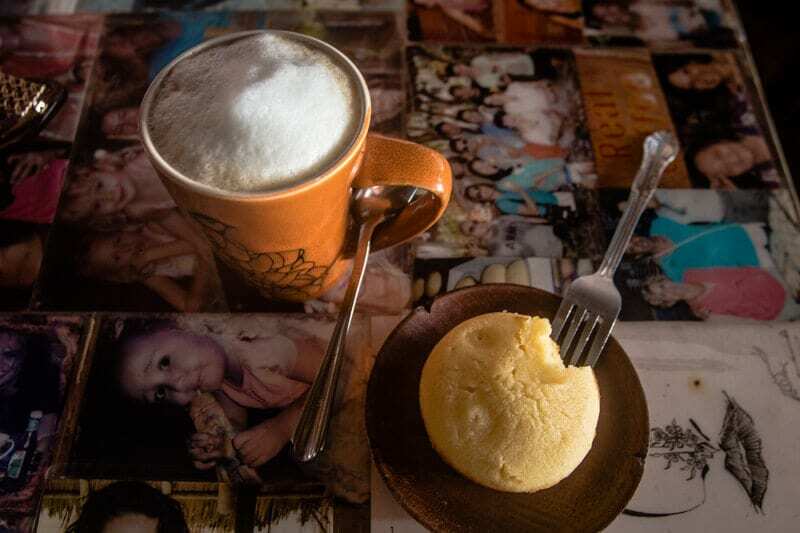 Recommended to us as a thing to do in Boracay to try a real coffee with a calamansi muffin at the Real Coffee in Station Two, Boracay. It was a delicious combination and we loved watching them froth up the milk over the hot stove. There are beautiful views from Real Coffee over White Beach as well, although the ocean views were obstructed by the protective typhoon walls. Damn typhoons. 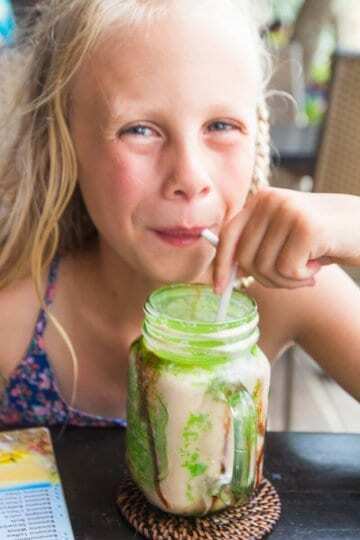 Another community member recommended the shakes from Jony’s Shakes at Station One. The papaya and lemon shake was delicious. But, the standout was Kalyra’s Bananatella. Very naughty for my standards, but oh so delicious. 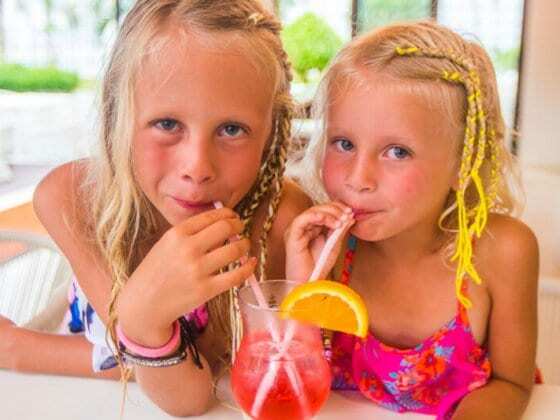 This is a must not miss activity in Boracay with your kids!! When you arrive on Boracay Island, you’ll hear everyone talk about D Mall. It’s quite the centre point of White Beach and a good marker to know where things are located. 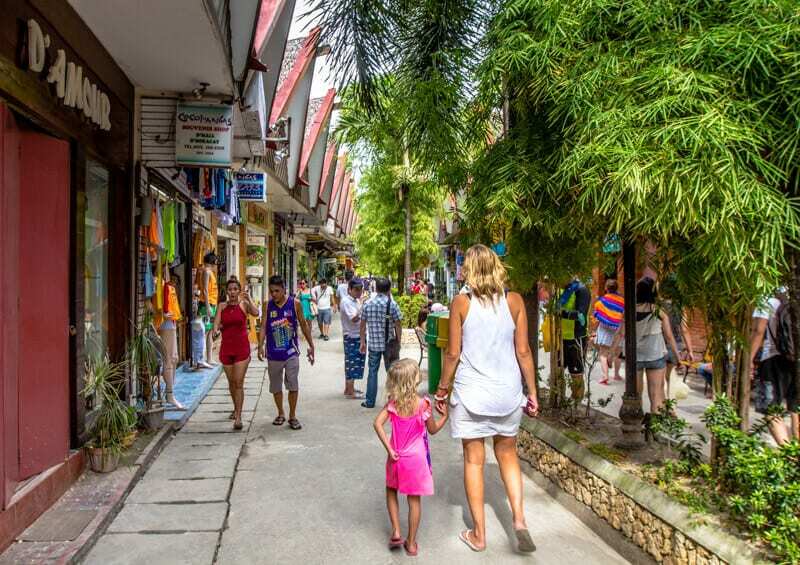 It’s the place for shopping on Boracay as well as many restaurants and cafes to eat at. There are hundreds of restaurants that line White Beach – take your pic and enjoy some ocean views and scenery. For a more local place to eat in Boracay, head down the alleyway off Station Two (you’ll have to ask someone to help you) to find PauPatri, but it’s worth it. Dining at PauPatri Restaurant was a tip from the Italian pizza chef at the Movenpick Resort. 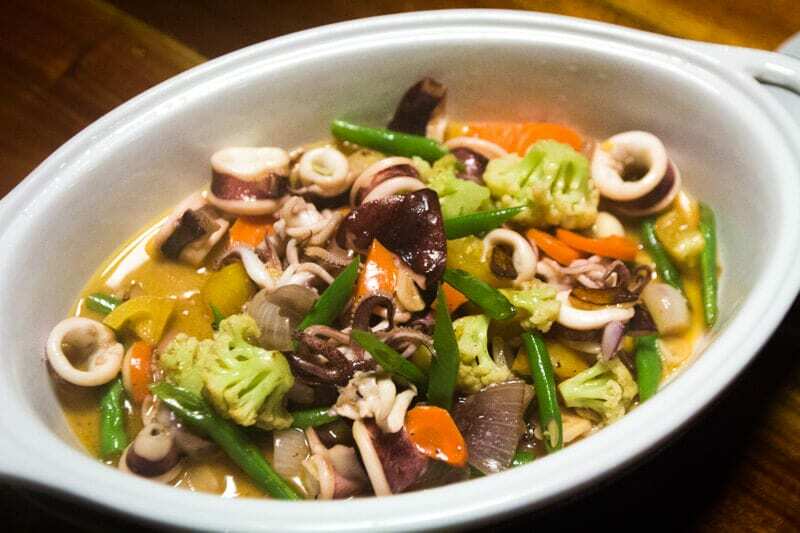 It’s Philippine cuisine in a rainforest setting. You have to take off your shoes and walk down a long wooden bridge over a waterway to reach the main restaurant area. Once there, little alleyways like spider web strings lead down to private wooden cabanas over the water. The prices are maybe slightly more than what you’d pay at the restaurants on White Beach. Eating out in Boracay is not as cheap as you’d think for an Asian destination, but for us, our meal came to around $55 Australian dollars. We ordered a lot of food too including beer, calamansi juice, and two juices for the girls. Sunsets on White Beach is an infamous experience on Boracay. We visited in low season, and I could not believe how many people there were on the beach. There is also an insane amount of boats going out for a sunset tour. I’ve heard these are good to do, but, for myself, I couldn’t stand going out on one of those with all the masses like that. I’d opt for other places on Boracay for sunset instead. Despite the crowds, I did enjoy walking along the beach at sunset amongst the atmosphere and checking out all the sand sculptures. The sunset wasn’t brilliant due to the weather, but I could see how amazing it would be. There are lots of young boys who’d be happy to sculpt your name in the sand for a price. 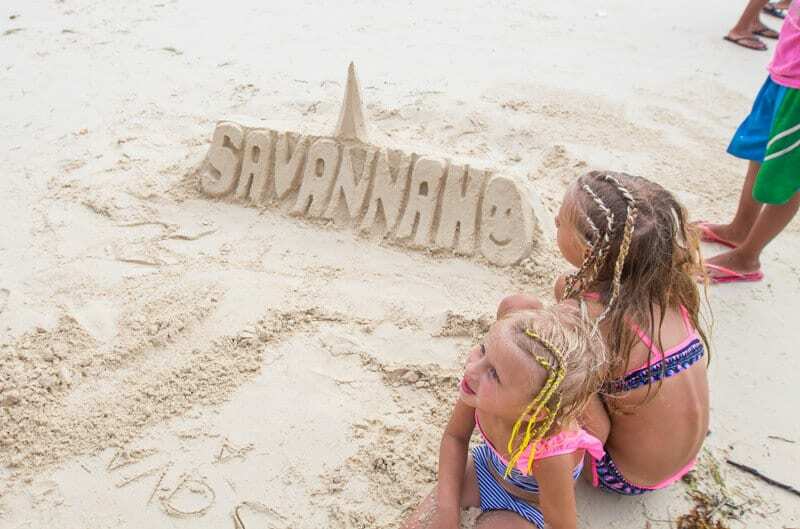 It wasn’t until the boys were halfway through carving out Savannah’s name that I twigged with what was happening. I thought when they asked me to write her name in the sand they were curious and friendly. I was more than happy to give them a few dollars. I was most impressed with their entrepreneurial spirit, and it offered a lovely exchange for the girls with some local kids. It also gave them an insight into creation and innovation! We have a separate review post coming on the Movenpick Resort Boracay. It’s possibly one of the best places we’ve stayed, especially for families. The service at the Movenpick Boracay was exceptional, there were plenty of facilities and activities, it’s brand new, and best of all, it’s on its private beach – Punta Bunga, which, as mentioned, I think is more stunning than White Beach. 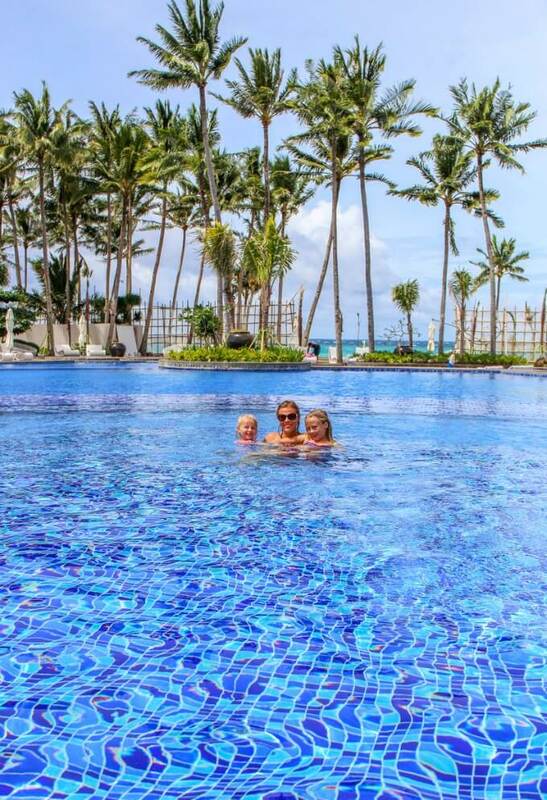 The girls will argue that the pool was better – it’s the largest we’ve ever seen. 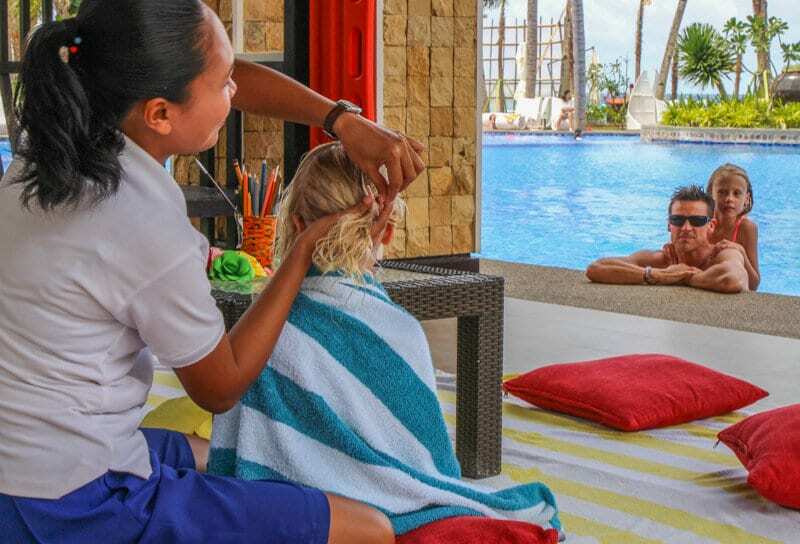 There are amazing things for kids to do at the Movenpick Resort including free hair braiding, art and face painting around the pool. Mocktail lessons and free chocolate hour every day. You might want to tell them about that one on your last day there else they’ll never let you leave this Boracay resort. By the grand opening in December, they will also have a hip and happening beach bar with live music. 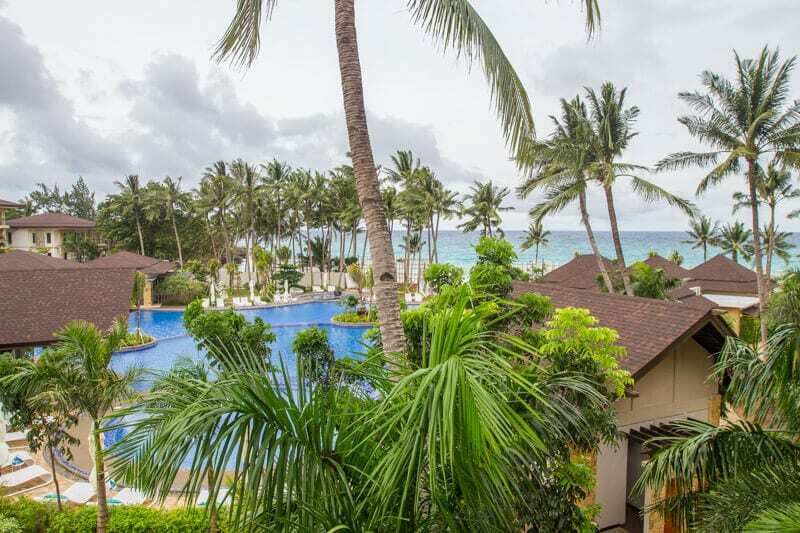 If you’re looking for a Boracay resort for families, you can’t go wrong with Movenpick Resort. Wifi is one of the most important features travellers look for now when making travel decisions. Those trusty phones of ours have become the centre point of our lives and are used for so many facets of the travel experience. We like to share ways you can get connect to wifi when travelling in the most convenient way for the lowest price. As family travelers, and family travel bloggers, we like to arrive in our destination with our wifi connection organised. We don’t want to be running around trying to find free WiFi and buying local SIM cards and we definitely do not want to be using international roaming. That’s the surefire way to bankruptcy! Thankfully, many telecommunication providers are noticing this need and are creating solutions to suit the modern day traveller. 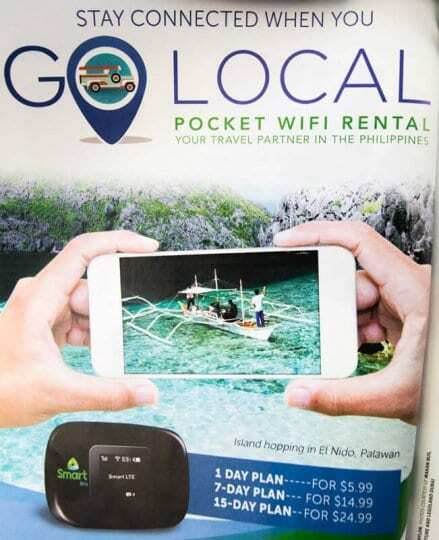 The GoLocal pocket wifi device was created by Smart, the Philippines’ largest mobile network to cater to those travellers, which means it has broad coverage across The Philippines with speeds of up to 42mbps compared to my current Australian connection of 38mbps. It’s a very convenient way to get connected without costing you a fortune. The device can be picked up at the airport or can be delivered to their hotel. We picked ours up from a booth at the airport – before you even walk out into the public waiting area!! You can connect up to 5 devices. For me, this is a standout solution. I do not want to track down local SIM cards for all of our devices. We have two phones, laptops, plus the girls have their tablet devices. Now that we’re traveling full time they use their tablets for homeschooling and movies if we get time. It’s super easy to connect – just like regular wifi. You can surf all day long. Mobile data in excess of 800MB will be delivered at a reduced speed. Data refreshes at midnight each day. Visit www.golocal-app.com to learn more about the device and to book it now. 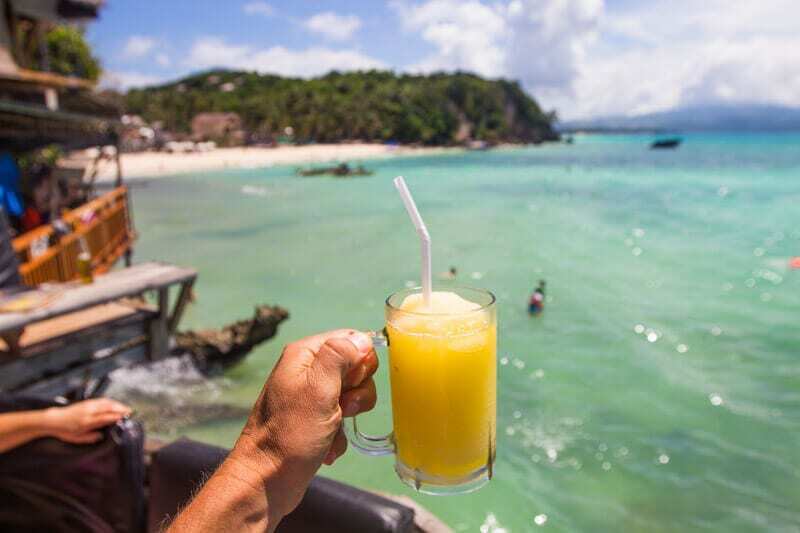 You can turn up to Boracay and be ready to connect. Then when it’s time to go just dr0p it back to the store at the airport. On Boracay Island, you can walk or rent a mountain bike or motorbike. Motorized tricycle taxis are also available. Be sure to negotiate a price before setting off. A shared trip from Station 3 to D’Mall at Station 2 should be 10-15PHP. A special trip is a private journey and will cost more than sharing with other trikers. The Movenpick Resort had a free shuttle running to and from White Beach, so we did not catch a trike. Our Italian chef told us to expect to pay around 100 – 130 pesos if we wanted to trike it. The easiest way to Boracay is via plane. We flew to Boracay on Cebu Pacific Air. You can read more in this post. You can fly to Caticlan or Kalibo. 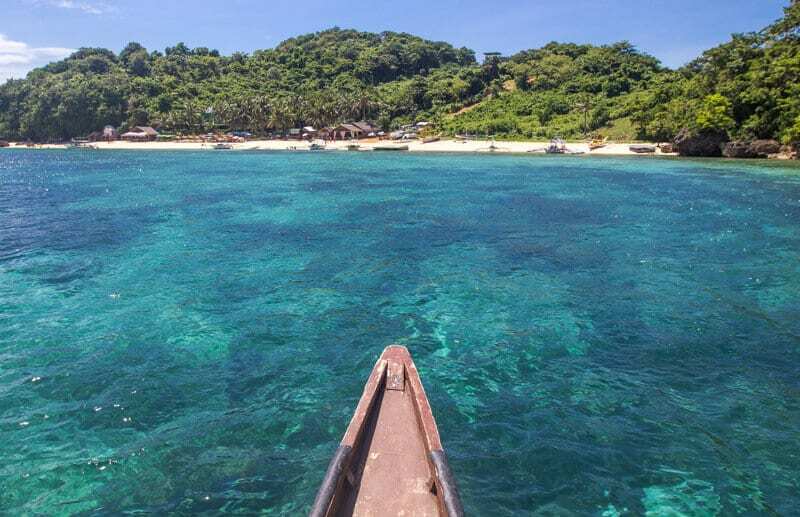 Caticlan is closest to Boracay and 15 minutes by boat. Kalibo is two hours away. 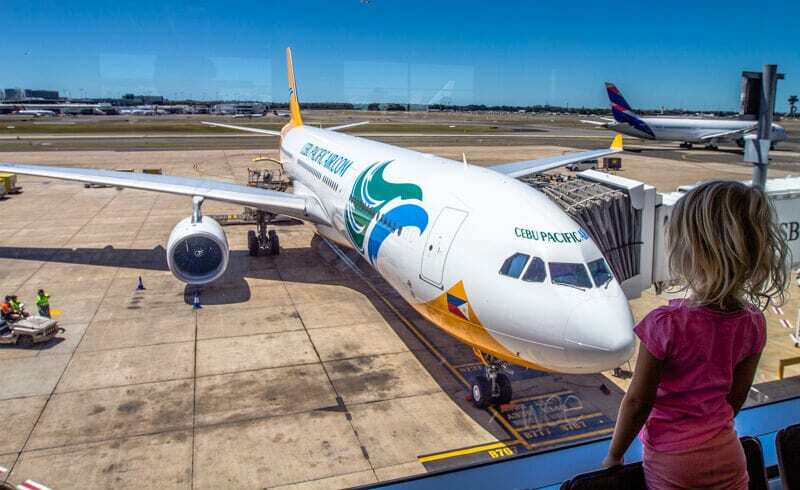 Download the new Skyscanner App to find your flights to the Philippines. The app makes it easier for you to find the best travel deals. It’s an all in one flights, hotel and car hire search engine app! 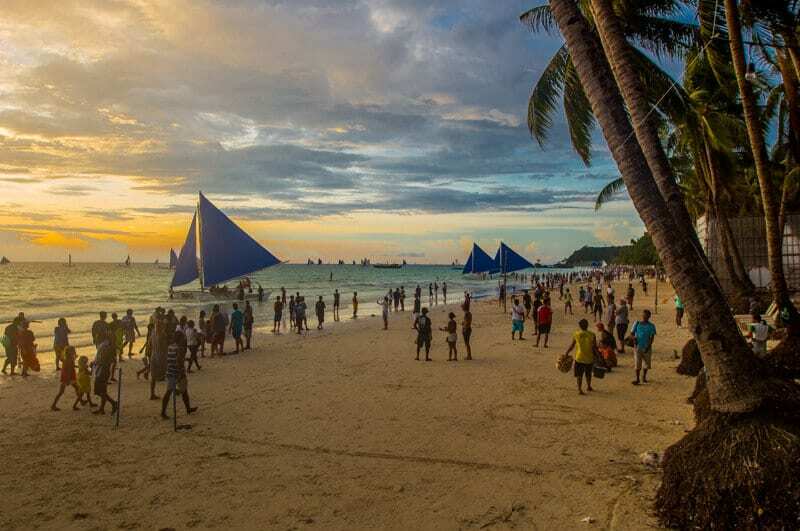 Best time to travel to Boracay: Outside of June – October which is the typhoon months, and it’s best to avoid the busy Christmas, New Years and Easter periods. Electrical output is the same as the US. If you have several tech devices that need charging, take a few US style travel adapters. 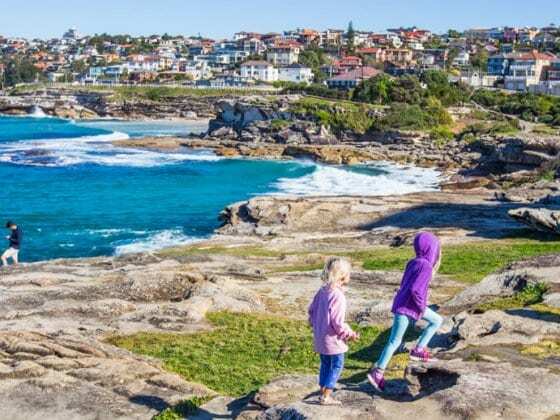 Timezone: UTC+08:00, which is three hours behind Sydney during Daylight savings time. 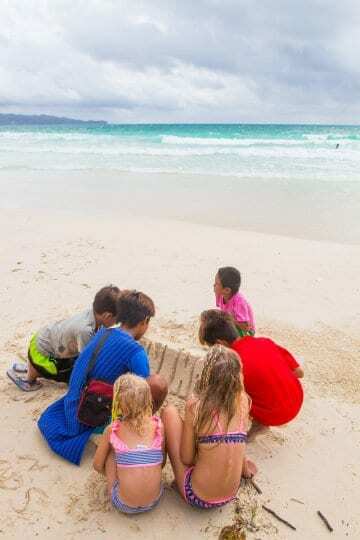 Can you add your tips for things to do in Boracay Island with kids to this list? Great post guys, so much useful information there. I think the Philippines is the next spot I want to explore with my family. 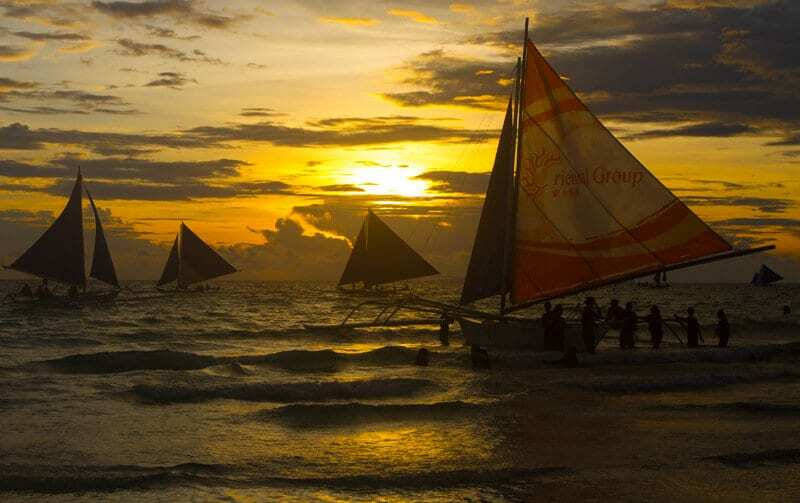 So many great things to do in Boracay Sally. Definitely consider the Philippines for a family trip! Hey guys, glad you found the post helpful in regards to the wifi. 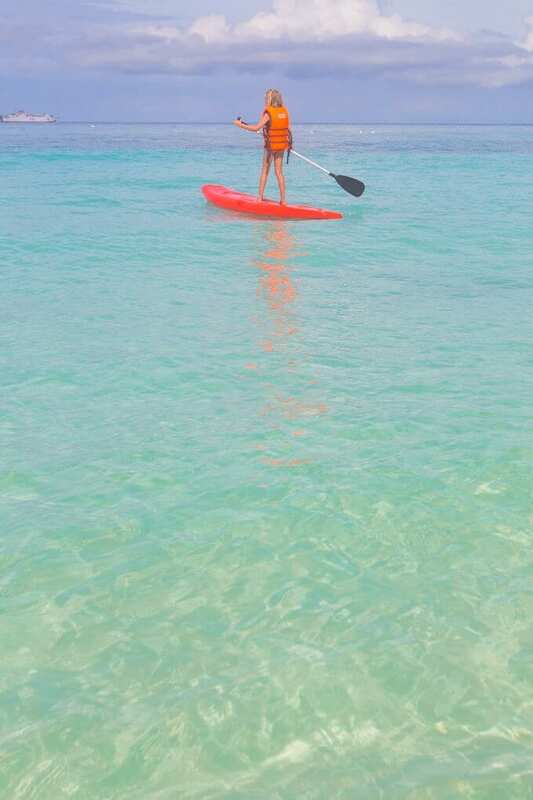 And yeah, there are so many great things to do in Boracay but Palawan looks amazing too, hope to visit there next time! What a great tips! Thank you for sharing such great information. Very inspirational! 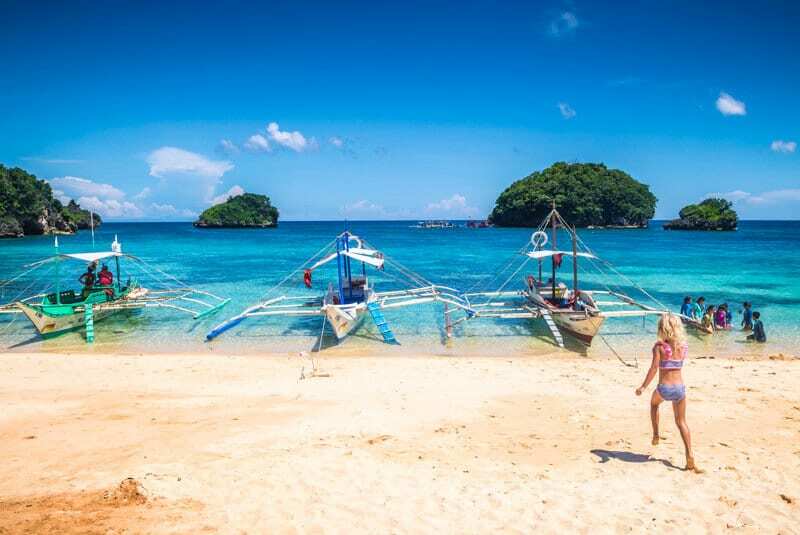 Never would have thought of the Philippines as a family travel destination but its on the list now, thanks! Hi Rich, we were very impressed ourselves. 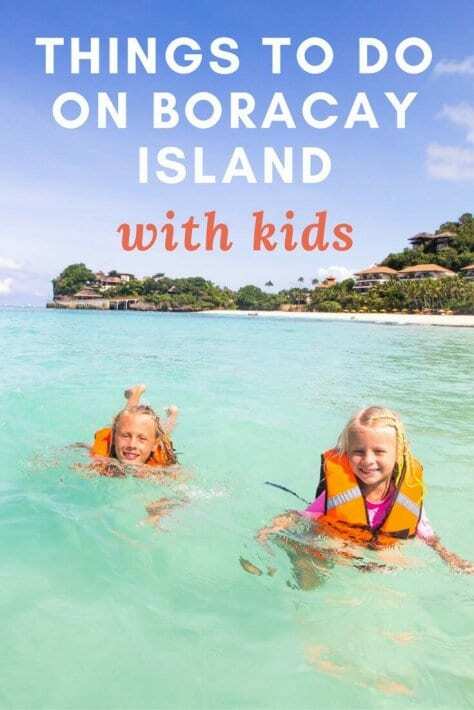 Definitely lots to do in Boracay with kids.